Can I interest you in a small piece of heaven? Wrapped up in a sweet little roll… filled with cinnamon and sugar and topped with a glaze that oozes into all the those wonderful nooks and crannies?! I know, I know… forget the single roll, you’ll take the whole pan! This recipe is one that I struggled to develop over the years. I can’t tell you how many batches of experimental gluten-free cinnamon rolls have met our trash can. Granted, some batches were good, but still not quite up to par. 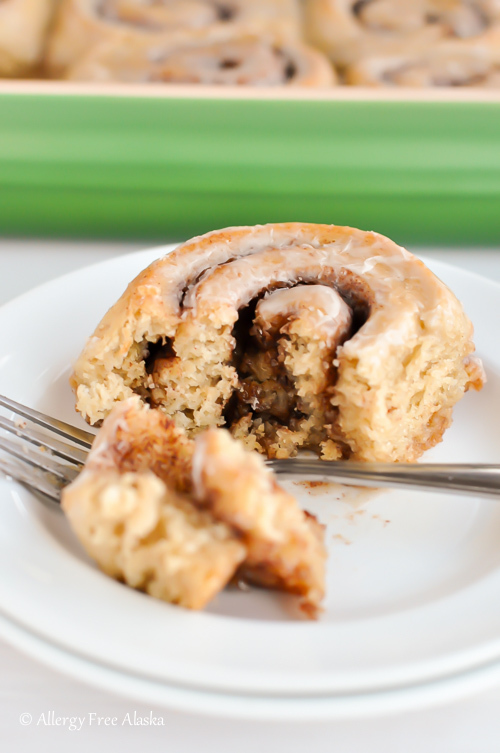 These Gluten-Free Dairy Free Cinnamon Rolls though… these are truly amazing. You won’t even be able to tell they are gluten-free, let alone dairy-free, corn-free, nut-free, and soy-free. The psyllium husk powder makes this dough very easy to roll out and work with. It’s almost like working with regular gluten-filled dough. Even though it’s literally taken me years to nail down the perfect gluten-free cinnamon roll recipe, I wouldn’t change it if I could. Some of my best recipes took the longest for me to develop. Like my Gluten & Rice Free Multigrain Bread, or my Best Flaky Gluten-Free Pie Crust. I think the magic of recipe development is in the journey. It’s taught me an incredible amount about how the different gluten-free flours and starches interact – what works, what doesn’t, what completely dries out a recipe, and what aids in retaining moisture and tenderness. These cinnamon rolls freeze exceptionally well. After the rolls are baked and cooled, wrap individually with plastic wrap and place in an airtight container to freeze. Store in the freezer for up to 6 weeks. Thaw at room temperature, and then heat up for 20-30 seconds in the microwave to soften. It is so convenient to have some of these on hand in the freezer! **The night before: Make the rolls as directed. Place rolls in the pan to rise, but rise for only 30 minutes. Cover the pan with plastic wrap, and refrigerate overnight. **The morning of: Pull pan out of the refrigerator and let warm up to room temperature for 2 hours. Bake in preheated oven as directed on baking instructions. 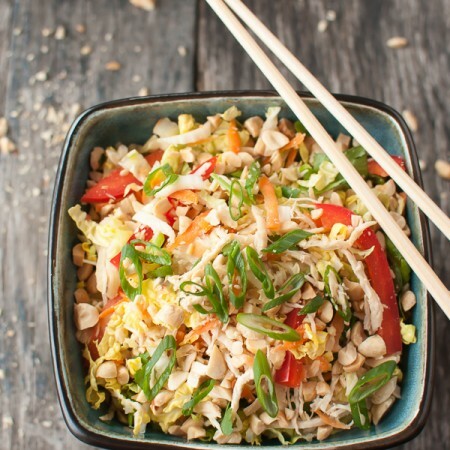 This recipe HAS BEEN TESTED egg-free, and does very well egg-free. To replace the eggs in this recipe, simply replace them with 2 chia eggs. To make 2 chia eggs, combine 2 tablespoons of ground chia seeds + 6 tablespoons boiling water. Let set at least 10 minutes before adding to the cinnamon roll dough. In a small mixing bowl, combine the 2 teaspoons of organic cane sugar with the hot water. Sprinkle in the yeast and give it a quick stir to combine. Proof for 8-10 minutes, until the yeast is nice and foamy. Make sure you have the other ingredients mixed and ready to go when the proofing time is up. In the bowl of an electric mixer, use the paddle attachment to stir together the tapioca starch, millet flour, sorghum flour, brown rice flour, psyllium husk powder, 2 tablespoons of organic cane sugar and sea salt. In a separate mixing bowl, whisk together the eggs, canned coconut milk, olive oil, honey, and apple cider vinegar. When the yeast is done proofing, add the egg mixture into the dry ingredients. Stir until the mixture is paste-like, and then slowly pour in the yeast mixture. Stir for 30 seconds on low. Use a spatula to scrape down the sides of the bowl and then mix for an additional 3 minutes at medium speed. The dough will be sticky and shaggy. Place the dough in a well-oiled large mixing bowl and push the dough down into the bowl with oiled hands or an oiled spatula, so it’s spread out evenly. Cover the bowl with a clean kitchen towel. Place in a warm spot to rise for an hour, or until double in size. Use a large sharp knife to cut the dough evenly in half while it is still in the bowl (the idea is not to disturb it too much). Lightly mist a large work surface with oil or water (I prefer to use oil) and then carefully lay down a 20-22” long piece of plastic wrap. Sprinkle the plastic wrap with 1 tablespoon of organic cane sugar. Sprinkle half of the filling mixture out evenly on to the rolled out dough, leaving an inch of raw dough along the top edge - the 16” edge furthest from you. This raw edge is where the rolls will seal shut. Starting at the 16” edge closest to you, gently lift the plastic wrap and use it to carefully roll the dough away from you into a cylinder. While you roll the dough, use your hands to gently squeeze the cylinder to ensure it is rolled tightly. Use the opposite side of the plastic wrap, the side furthest from you, to roll the cylinder back towards you, so the cylinder is sitting in the middle of the plastic wrap with the seam at the bottom. Blunt or pinch the ends of the cylinder closed so filling doesn’t spill out. Use a 12-inch piece of unflavored dental floss (or thread) and very carefully slide it under the dough to the middle of the cylinder. To make your cut, pull the ends of the floss up and cross over the top of the dough. Continue to cut the cylinder into 8 equal sized rolls. Repeat steps 8-12 to finish rolling out and forming the second half of remaining dough. Place the rolls cut side up in a well-greased 9x13” baking dish; the edges of the rolls should have some space between them to leave room to rise and expand. Cover the baking dish with a clean kitchen towel and rise in a warm place for 1 hour. Preheat oven to 350 degrees (F). Bake for about 35 minutes, or until the tops of the rolls are golden brown. Frost the rolls with the glaze while they are still slightly warm. Consume within 2-3 days. Not all psyllium husk powders produce the same results. I highly recommend using the Now Foods brand. DIRECTIONS FOR MAKING THE NIGHT BEFORE: Form rolls and place them in a greased pan to rise, per recipe directions. Cover with plastic wrap, and rise for only 30 minutes. Place in the refrigerator overnight. 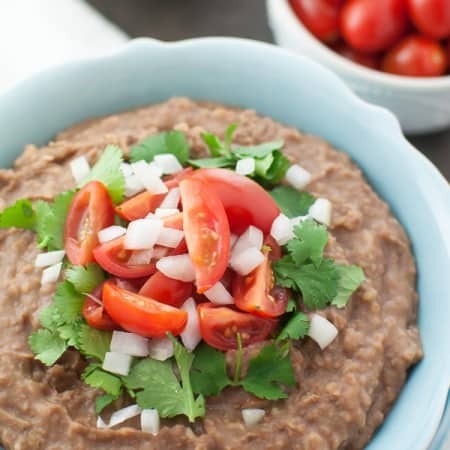 The next morning, remove from refrigerator, and place on the counter to rise at room temperature for 2 hours. Remove plastic wrap and bake in a preheated 350 degree (F) oven for about 35 minutes, or until the tops of the rolls are golden brown. Frost with glaze per recipe directions. Megan these look so good! Beautiful photos too. My mom always had cast iron pans and I just love the way food turns out. I don’t have any and this set would be great. These look delicious! Going to make them for my contribution to Christmas morning breakfast. Oh my stars!! These look amazing! I’d love to win the cast iron set. I’ve never bought any due to the expense but have heard great things and can’t wait to try! Yum! I cannot wait to try this recipe! Currently using my cast iron between my camper and my house. Would be nice to have a set in each. Thank you for this-I have missed cinnamon rolls! YES, YES and YES!!!! !I can eat cinnamon rolls without suffering ! Happy dancing. Thank you!!! because cast iron is THE best cookware ever! Megan, Your post not only excite me about my usually stressful limited diet, they spark inspiration! thank you so much for being a beacon for all of us!! I really can not wait to try these. I used to make carmel rolls for Christmas morning as well as orange Dk Choc rolls, alas I can not eat any of those any more. This WOULD be wonderful to rekindle that old tradition with! I have one Lodge piece that I purchased at your and my mothers behest…I would LOVE to add to that collection, as I have always been thrilled with the output of the one I do own!! Thank you for all your time and research!! These look beautiful AND delicious!! Yes!!!! Yes!!!! Yes!!!! Finally a GF, DF, cinnamon roll recipe. I make the Pioneer Woman’s cinnamon rolls for my son’s b-day every year, per his request. It’s always soooo irritating that I can’t eat them because in my former GF days, cinnamon rolls were one of my favorites. I’m so excited to try this out. My grandmother taught me to cook when I was young, and unfortunately after she died her cast iron pans were discarded. I would love to have a set again so it would be like I was cooking and baking with her again, but this time with my teenage son! Oh, Megan! These look amazing! I definitely need to do this SOON! Just got my first cast iron pan and love it!! These cinnamon rolls are awesome. Thanks so much for the recipe! I have one cast iron pan and I love it having a set would be wonderful. I would LOVE to win this set because I can not afford to buy it. I need more iron in my diet, and this set would help me get it! Oh how my husband would love these. The Cinnamon buns and cast iron set. We had to get rid of our old ones, which were my nana’s and we loved them but thought they may have been a source of contamination for my husband after being diagnosed with Celiac Disease. Still have yet to replace them. I need my own cast iron pan then I will not use my mom’s anymore. Yummy cinnamon rolls! Beautiful pictures! These look amazing. I’ll be making them for the holidays! Thanks for such a great giveaway! We used to cook with cast iron when i was a kid. Such great family memories made together. I would love a set of my own cast to use as I make memories with my own kiddies…. can’t wait to make these Megan. All your recipes i try are always fabulous! Now to the cast iron…I rarely even put mine back in the cabinet because I use it so much. I only have one though and would LOVE to have the different sizes from which to choose! Thanks so much for this opportunity. I already have a set of cast iron frying pans and dutch oven. One of the un-matching frying pans was my grandma’s and I think of her every time I use her pan. Such warm memories are evoked when I use her pan. These cinnamon rolls are luscious looking! I will have to tuck this recipe away and use it to surprise my family. And I’m going to try an egg replacement to substitute the eggs and let you know the results. A child in my son’s 4K class is severely allergic to eggs, and this would be a fun treat to bring for a birthday treat if the egg replacement works. I also am so glad you are using the psyllium husk powder since our family responds much better to psyllium than to the gums. You’ve put a lot of work into recipe testing and we appreciate it! Wondering how the egg replacement worked, and what you used. Both my daughter and I are IgG allergic to egg whites and IgE allergic to yolks. I haven’t tried making this recipe egg-free, so I’m not sure what the results would be. I’d imagine it would do okay, though. Hi, I’ve made these twice and replaced the egg using ground flax seed and ground chia seed. 1 Tbsp of ground flax or chia + 3 Tbsp’s water = 1 egg. I’m very allergic to eggs as well. Mone turned out amazing, can’t wait to make them again, they are a new favorite! I always read how wonderful cast iron is to cook with. I would love to try them out and see for myself. Thank you so much for this opportunity. I love all of your recipes! Cinnamon rolls will be great Christmas morning while watching our Grandsons open their gifts. My Grandmother always used cast iron pans when cooking. These would be great to use for all of my gluten and dairy free recipes. These look so yummy!! I cannot WAIT to try them! My husband would be so happy to receive this cast iron set. Thanks! My husband and I were talking last night how we would love to cook with cast iron; we have friends who swear by it. We’ve been working on building our kitchen, so this is on our wish list! These cinnamon rolls look awesome! My daughter is hoping to be so thrilled when I make these!! These look so delicious ! Going to try to make a batch before the holidays and then serve them up thanksgiving morning!! Thank you for all your hard work finding yummy recipes. First can I just say THANK YOU!! This recipe looks phenomenal!! I can wait to make these for my family. I have always heard how amazing cast iron is…this would be a great addition to our kitchen. Don’t want to buy them at the thrift store since that would be a contamination factor no matter how well you cleaned and seasoned it. Thank you for this opportunity!! I have never used cast iron before but I know you keep raving about it and would love to check it out myself. Also, this recipe sounds great to me, as I’m already GF but dairy, corn and soy bother me as well, and since these cinnamon rolls have none of the above, they sound perfect! Always fun to see what you’re up to in the kitchen! These look amazing and I know someone great to make them for! These look so good, I can’t wait to make them. I have one cast iron pan and I love to bake cakes in it! Just looking at these beautiful cinnamon rolls is almost enough to satisfy my want of them! Those rolls are stupendous……..and am going to try them. Thank you. I have used cast iron for, do I have to say how many years?, 🙂 my daughter needs to have some and really doesn’t want to wait for me to die!!! I just discovered your blog and thank you so much!! Just curious what altitude you are baking the rolls at? I live in Colorado & it seems everything here requires adjustments for high altitude. These look so delicious. Really looking forward to wowing the Family for Thanksgiving. I think my house sits at about 500 feet above sea level, so definitely not very high up in altitude. I hope you enjoy them! I have only ever owned a small cast iron skillet, but my family is much bigger now, and it would be great to have a few pieces of cast iron cookware. And this recipe looks great, I wil definitely have to try it sometime! I would love to win this set because I absolutely love cooking (especially baking) in cast iron. I have one small cast iron frying pan that I use all the time, but it would be great to have some different sizes and types of pans. These look really good. However, I am also allergic to rice. Is there a flour that will replace the rice flour? I would sub 1/4 cup more millet flour and 1/4 cup more sorghum flour for the rice flour. Can I ask why you like the particular brand? I have a Le Creuset pot. I love it but it was very pricey. My Le Creuset baking pan is one of the only Le Creuset pieces I own (my other piece is a coffee cup). I think Le Creuset is beautiful, but you’re right – very spendy. The pan you see pictured I won at a fundraising auction. 😉 I love it’s color! Yay!!! I can’t wait to try these. I miss having warm, gooey cinnamon rolls since going gluten free. These cinnamon buns look so good, I have printed the recipe and will give them a try for sure. thanks for the recipe and contest. We have an old cast iron fry pan we use for camping and it’s awesome! These cinnamon buns look so good, I have printed the recipe and will give them a try for sure. thanks for the recipe and contest. We have an old cast iron fry pan we use for camping and it’s awesome, I would love to have a cast iron pot too. Because I don’t have one and because I want the health benefits from the cast iron! I have thrown all my non-stick Teflon pans. We now only use glass, ceramic, or cast iron pans. This would be a great set for my family!! Great prize. I would love to win! Cinnamon rolls look absolutely delicious and so excited for such a great giveaway.. lodge is the best! The cinnamon buns look amazing! I am a celiac with very low iron and I have been wanting to get cast iron pans for a while. I could really use the extra iron! They look so yummy! Do you have a suggestion for an egg substitute? I can’t have eggs. Thanks! I’ve used ground flax seed to replace the egg. Worked perfectly. 1 Tbsp flax + 3 Tbsp’s water. The cinnamon rolls look so yummy. Will surely make them. I have no cast iron pans, so would love to have them. 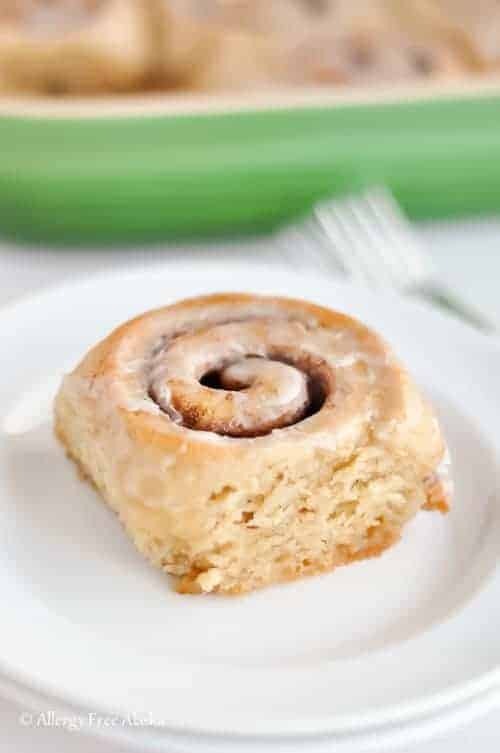 the cinny rolls look delicious!…i would love to win the cast iron because i think it would be fun to learn to cook on them! Got to try these cinnamon rolls for my husband! And I’d love the Lodge pans…I grew up with Sunday dinners made in cast iron. Mmmmm! Thank you so much for your dedication and effort put into the development of these beauties! I have been craving for gluten and dairy free cinnamon rolls for ages and finally found your recipe!! Have you tried to make these with an egg-free option? Hi Linda, no I haven’t. I would love to win this cast iron set. Never used cast iron, so this would be nice. Also, need to try these cinnamon rolls. Oh my goodness! Thank you for developing this wonderful recipe! Your recipes look amazing…our cookware js getting old and worn so I’d love to win this! PHENOMENAL!!! These Cinnamon Rolls will be on my mind for days, Megan! These cinnamon rolls look great, just like mom used to make. I haven’t wanted to make then since going gluten free. I think I will try. I would love to have this set on cast Iron pans. My mother always used hers. That is one thing I miss since she had past. I commented before I decided to enter your giveaway so please feel free to delete my earlier comment which said how phenomenal these Cinnamon Rolls are and how they’ll be on my mind from this point on! Why I’d like to win this set: I love the Lodge cookware, too, and could really use several items in this set. Skillets are a given, but I love using a cast iron griddle (which reminds me of my grandmother) and the Dutch oven could be used at home and while camping! Thanks for the recipe and the giveaway, Megan! Since going gluten free I just thought I would never eat cinnamon buns again but I have just found my weekend project. Going to whip up a batch of these. Love, love, love cooking with cast iron. What a timely offering! I was just shopping yesterday looking at the cast iron cookware available in my area. It was a short shopping session since I live in a “town” that is out and away from anything near to actually do shopping. So should I be the eligible winner of this set my desires would be fulfilled! BTW…I’m so looking forward to trying these Cinnamon Rolls as soon as my psyllium husk powder comes in via UPS! Thank you for all your hard work and many trash offerings to help us out in our endeavors! Another recipe to try! I am now making the Gluten & Rice Free Multigrain Bread as our go-to bread, even measuring out the flours and refrigerating them for future loaves because we eat this bread so fast. The hamburger buns are also a hit with us. I’m looking forward to making the pie crust recipe and this cinnamon roll recipe soon. In your recipes you refer to your cast iron ware for cooking. I would love to win this set to get closer to meeting high standards from my own kitchen! Thanks for the effort you put in to creating these recipes, and then to provide clear directions for how to make them. I don’t have anything cast-iron, and I would absolutely LOVE to cook on the stovetop and then put in the oven all with one pan. Yum!!!! Can’t wait to make these cinnamon rolls! One of the foods we miss so much!! 🙂 I have one cast iron skillet and it’s always dirty! 😉 I would love to have more to use! Thank you so much!!! I can only hope these taste as a good as they look. I love my pre seasoned cast iron and would love more. Cast iron is great, and the pre-seasoning makes maintenance a breeze. Looks delicious! Excited about trying the recipe and possibly winning an amazing set of cookware!! These cinnamon rolls look so darn delicious. I use to always make cinnamon rolls for breakfast on Holidays and I can’t wait to try this recipe. Couple questions though can you make the dough the night before and then bake in the morning? Can the baked rolls be frozen for later? Oh forgot in my other post to say why I wanted to win the cast iron set. I have one cast iron pan from my grandmother and I really love it but now that I know how gluten effects me I’m a bit nervous about using her pan because I know it has browned many a roast with flour and baked many wheat flour rolls so I would love a to have new cast iron set that I know will never had flour in it. Be such a blessing to have not just one skillet but a whole beautiful set of cast iron to make meals that my whole family can enjoy. I just can’t get over these cinnamon rolls! They look heavenly!! I would love to win these because I don’t have any cast iron skillets or pans at all! love frying in cast iron skillet would love to cook in the pots too thx! These look great. Would be great for Christmas morning. I want to win because my daughter needs cookware. I love my skillet but would like to have the pot as well as the crepe pan. Cast iron is awesome to cook on! I have used cast iron for years. I have a friend who is just getting started using it & only has one kettle so far. I’d like to win this so I could give the set to her. i’d love to have a set of my own for when i move out someday!!! I’d love to try cooking with cast iron! i don’t know if it’s safe to use nonstick pans so i think the old-fashioned way is best! I love to cook and to bake, it was my career til a motorcycle accident I had 9yrs ago. I had to relearn how to do everything from walking to reading/writing. When I became s o allergic to wheat and dairy I had to relearn how to cook I found it was it’s easy to change recipes like using cornstarch And soy/rice milks. Now I’m relearning how to bake and I’m finding it a lot harder to change up recipes like making bread using different flours and not kneading, so different. I’ve researched different flours and looked up different blogs and honestly your blog has been the best I’ve ever seen. I’ve used the pie crust and now pie is great again, I grew up a farm girl and always eaten a lot of pie. I can’t wait to use all your breads. I miss good bread sooo very much, your baguette recipe I’m making tomorrow. Your clearly understood tips and directions make it so easily understood, for me I need to reread things to understand them but the way you write is like Alton Brown so easy to relate. My most treasured cast iron pans that were past down to me were lost shortly before my tragic accident in a fire set in my apartment building, seems I keep having to restart and fight to restart my life. I miss them all so much. I haven’t been able to replace them because they coast so much here in CT were I live now helping to raise my boyfriend’s 14yr old wonderful nephew, who loves to cook and we cook together. It would mean so much to win cast iron, the Dutch oven for baking and soups/stews the skillet you can make anything with them, and each time used the better seasoned they become. My husband and I have always loved cooking with cast iron. Over the years, we’ve seasoned ours with peanut oil. We had to stop using all of our cast iron when we found out our son is allergic to peanuts (as well as dairy, wheat, tree nuts, eggs). It would be wonderful to have a new set of safe cast iron to cook with! So excited to try this recipe and bring back this yummy breakfast treat! Grateful to folks like you, Megan that take the time to share! Cast iron…I believe everyone should cook this way. Back to the basics. So excited to try these yummy cinnamon rolls! Oh how I have missed them! Thank you, thank you, thank you! Every home should cook with cast iron cookware. Reminds me of my childhood at grandma and grandpa’s. These last couple years our family has been eliminating gluten and finding better health. I say, back to the basics of sustainable living! My daughter is fighting PCOS and is on a gluten, milk, potato, soy, white rice free diet. It is very hard for her to prepare all she needs. I would love to win these and give them to her to cook with. So winning would not just be for me but her, and the potential grand babies that my come because she is eating this way. Cast iron is my favorite cookware and I keep “sharing” mine with my friends… That means that I need some for ME. What a lovely batch of cinnamon rolls! I think these will have to be breakfast on Christmas morning. I would love to have a good set of cast iron, then my kitchen tool collection would nearly be complete! Since my now 3-year-old went gluten free (at 16 months) there have been many things I’ve been stressing about learning to make gluten free. Cinnamon rolls is one of them but I’ve been so satisfied with so many of your other recipes that I have to make these for Christmas this year now! I can’t wait!! Especially since we will be getting a mixer soon so that will help me a lot. You’re amazing! Thanks! Found your website looking for a recipe for allergan free ranch dressing, and found so much more! I have four grown daughters, three of whom have food issues with themselves or their children. Everyone is coming home for Thanksgiving and I have found a lot of help in your recipes. Also, I grew up using cast iron skillets, have had several over our forty years of marriage, and all our girls showing an interest in them, so winning this set would be fantastic! I grew up using cast iron skillets, have had several over our forty years of marriage, and all our girls are showing an interest in them, so winning this set would be great! My husband bought a large cast iron skillet – but it is so huge! I would love to have various sizes to work with. They are the best way to cook bacon! Thank you for offering such a great give away. My wife loves your recipes and we both appreciate your sharing them. Thank you for posting! Would love to win the cast iron! Happy Thanksgiving everyone! I miss making cinnamon rolls! My mom used to make them for us on snow days from school and for holiday mornings! I think I will be making a batch of these this Thanksgiving!! Thank you for all of your awesome recipes! 🙂 And thanks for the chance to win the cast iron set! Love cast iron!! I love cast iron pans and the few I have don’t feel like enough since they are becoming my ‘go to’ pans for everything. Thanks so much for the chance to win these beauties. I would love to cook with Cast Iron for the added Iron I need in my diet! i Love your recipes. I’m kinda new to gluten free baking and cooking (I’m allergic to wheat and sensitive to casein) and your site is great for ideas and learning. I love cast iron (I have one pan) and would love to win these to explore even more. I just started using cast iron cookware and I am HOOKED!! Now I need more cookware!! I only have one pan!!! I would love to have this for healthier cooking!! I’m so excited to try these! 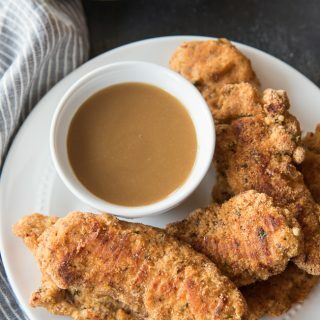 It’s not often that I find a recipe for a comfort food that I don’t need to alter since most gluten free bloggers are not dairy free as well. My kids and I are gluten, dairy, and egg free and my youngest also is corn and soy free on top of that. It can be quite challenging for me to find something that tastes good and I’m not very creative in the kitchen (I’m working on that!) so it’s very exciting to run across recipes like this! Thank you for sharing! Thank you for amazing recipes! I love cooking in cast iron. 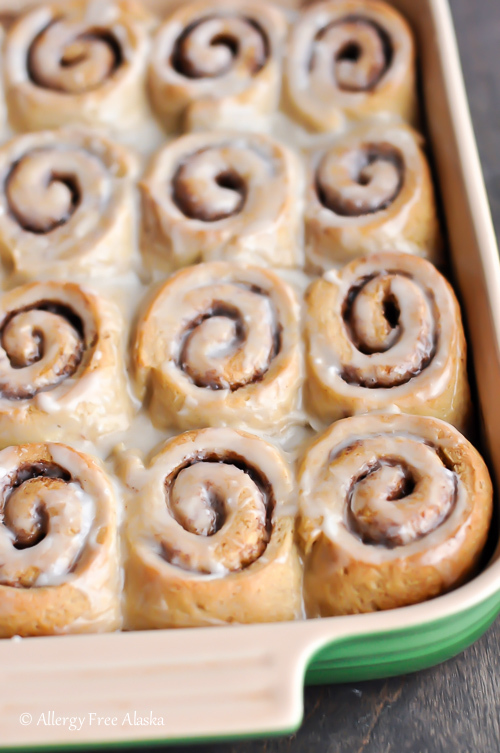 These look so wonderful…my oldest son loves cinnamon rolls. While we don’t have gluten allergies here, I think I’ve mentioned here before that we do cook gluten free on occasion because my youngest had issues in the past and I feel like its best not to overdo it with the gluten. I love it when I find a recipe like this! Thank you so much for sharing it with us at Foodie Fridays! I hope you’ll be joining us again next Thursday! And of course I have to enter your giveaway while I am here! I don’t have any cast iron and I would really like to! 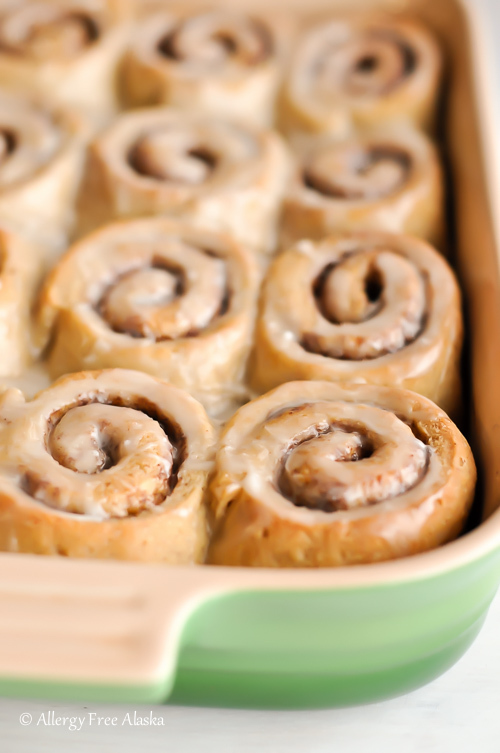 these cinnamon rolls look fabulous…can’t wait to make them! As for the cast iron, hands down it’s the best…would love to own this set!!! would love to have more cast iron! cinnamon rolls look great! Thank you so much for the wonderful detailed recipe – I am so excited to try these for the upcoming holidays. Thanks for inspiring me. I don’t own a cast iron pan so I would love to be a winner. Wow! The cinnamon rolls look amazing! Would LOVE to win this set of Lodge cookware! These look amazing!!! Can’t wait to try these!! Now I need to go make some cinnamon rolls… thanks. 🙂 And thanks for sharing these at Savoring Saturdays. Came here via a friend for your pie crust recipe – these rolls look amazing! Now I have 2 things on my to-bake list. These rolls were so inspiring! 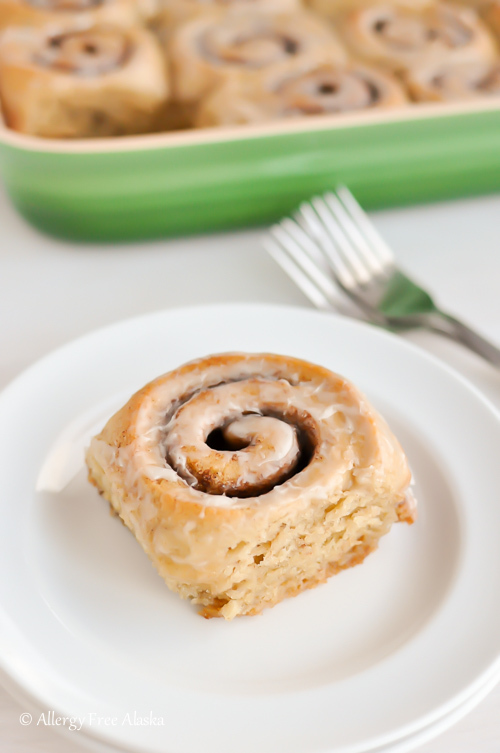 Yes, it is possible to make great gf df cinnamon rolls at home. And yes, you can never have too many cast iron pans! cinnamon rolls are a Christmas morning tradition in our family, these look awesome. So perfect for one pot meals! I would love to win this cast iron set! I have been wanting a set for a couple years now…just can’t afford it at the moment. I hate cooking with the chemical coated non-stick cookware! Also, can’t wait to try these yummy cinnamon rolls! I would love to give these a try! We used to do cinnamon roll Saturday every week until we figured out the kids had allergies, but I have been to scared to try making them! My mom always cooked with iron skillets, but I didn’t start until a few years ago. I have one piece and absolutely love it. I’d really like to win this set to enlarge my collection. I would love to win these cast iron pans so that I can make biscuits! Thank you for sharing your amazing recipes and gluten free knowledge. Growing up with cast iron I love it…not having any as an adult and mother…sad. i love cooking with castiron! I would give it to my daughter for Christmas! I’ve been wanting to make the switch to cast iron forever! Love this. Cast iron is the best and these cinnamon rolls look awesome. Going to have to make some. These look delicious! I’m out of sorghum, though – do you think I can sub chickpea flour for the sorghum? I haven’t tried making this recipe with any other flours other than the ones listed above. I’m not sure if the premix would work – you’d just have to try it to know for sure. These were amazing! I am a pro cinnamon roll baker, or at least I used to be before going gluten free. Your recipe is so good and made me incredibly happy to be able to eat a cinnamon roll again. Your cinnamon rolls look delicious. I have one question before I attempt to make them. I have whole psyllium husk which I recently purchased from the health food store. Can I use it instead of the psyllium husk powder? Thank you so much!! This recipe is perfect for my GF.son…but he is allergic to coconut..can i substitute it for something else? Can he have dairy? How about half and half or heavy cream (whatever is the same consistency as coconut milk)? Those cinnamon rolls look so lovely! I have a question about coconut milk. When you measure “full fat” coconut milk from a can, what are you actually measuring? Only the white thick part, or the clear watery stuff, or some of both? And if some of both, how much of each? This has been a puzzle for me the last week or so and I am hoping I figure it out because guessing only goes so far…. As far as the psyllium husk powder, can I leave it out or sub in something else? I have a lot of unique ingredients in my kitchen, but that is not one of them. Thanks! Take a can of coconut milk, whisk it well, or throw it in the blender to make it smooth, and then measure it out. 😉 This recipe was written in particular with the psyllium in mind. I don’t suggest trying anything as a sub for it. It’s what binds the recipe together. Hello!! I recently found this recipe and it is amazing!! I had to sub millet for white rice, sorghum for all purpose blend, and psyllium for xanthum because I didn’t have those ingredients. My only negative was that the dough was very sticky and didn’t roll. Otherwise, I loved the rolls I made out of this recipe!!! Thank you so much!! I just found this recipe and it looks amazing. My 4 yr. old son has multiple, severe food allergies, He’s allergic to eggs and I usually substitute a flax seed mixture with other recipes. Will that substitution work for this recipe? Let the mixture sit for at least 10 minutes before adding to the dough. It works, I’ve done the replacement and they turned out fabulous! I must be the only one having problems with the recipe. It looks wonderful and I am in the process right now of making them. After mixing everything together as you say…the “batter” is so runny there is no way it is sticky or paste like or thick at all. Are you sure your measurements listed for your flours are correct? I can’t see how this will even thicken to be able to roll. It is like soup. Isn’t the batter suppose to be somewhat thick? Yes, I’m sure the measurements listed are correct. I’ve made this recipe (from printing out the recipe card) several times. Many readers have also confirmed their happiness of the recipe as written. Are you using psyllium husk powder or whole psyllium husk – it makes a huge difference in the recipe and I don’t recommend substituting the whole husk for the powder. Also, I’ve noticed a difference in the way different brands of psyllium husk powders behave, which is why I suggest using the Now Foods brand. When you first mix all of the ingredients together, the dough is watery, however as you mix it, it thickens up. Best wishes to you! I hope you can figure out the issue. after raising…and following your directions with proper ingredients…it was so runny I could not mold it at all. Not sure what I did wrong. The only thing I can think of would be for the coconut milk….you said full fat. Which I used but I didn’t used the skimmed hard part that was the full fat. I mixed the coconut milk together – in the can which was full fat. Then took my 7 Tablespoons. Seems like there was a lot of liquids in this recipe… Really 7 TBSP coconut milk & 6 TBSP oil with the other liquids to boot? I can assure you the measurements above are correct. Psyllium Husk powder is incredibly drying – it requires lots of moisture to produce moist baked goods. You measured the coconut milk correctly. I’m sorry the recipe didn’t work for you. Can you use white vinegar rather than apple cider vinegar? Just wondering if that substitution would make a difference? Yes – you bet, you can! I’ve made these delicious cinnamon rolls using ground flax/chia to replace the eggs. 2 Tbsp’s ground flax seed + 6 Tbsp’s water = 2 eggs. I have a sensitivity to tapioca(among a ton of other things) which flour could I sub I place in this recipe? I’ve scoured a lot of recipes and yours is the only one that is gf, df, uses cane sugar (I have a fructose sensitivity and can only eat can sugar, maple syrup, honey or brown rice syrup), and does have any of my other allergens. I don’t even know where to begin…eating these now at 2:48 in the afternoon after just coming out of the oven (I got a little late start deciding I wanted these for “breakfast”. The texture is divine, they rolled out beautifully with the aid of the plastic wrap, they rose so perfectly. My first comment out of my mouth after I tasted them, to my daughter who was anxiously awaiting a bite, was “I think I’ve died and gone to Cinnabon heaven”. But these are so much better than Cinnabon – Thank you, thank you for your creation. Your comment made my day, Donna! You are so welcome; I’m happy you enjoyed them and that the recipe worked so well for you! I have never used/purchased millet flour, but had everything else for this recipe. I subbed out 1/2 cup buckwheat flour and increased the brown rice flour to make up the difference. I plan to purchase millet as I keep running into recipes that call for it. Due to an egg allergy I used 2 T flax with 6 T water and let it gel as I waited on my yeast mixture. Due to the buckwheat, my rolls are darker in color, but they are amazing, and even my allergy free husband and kids love them. I loved that these weren’t any more complicated than the old “standard” recipe I made before food allergies changed my kitchen completely. Thanks again for an amazing addition to our breakfast favorites! These look absolutely amazing! I wish you had step-by-step photos though, I’ve never made cinnamon rolls before and so nervous I would mess it up. I have been enjoying your recipes for a while now! I am allergic to gluten, lactose cane sugar and dark chocolate. I have used Swerve in other recipes and was wondering if you would recommend it for a sugar substitute in this one? Or would Coconut sugar be better? I actually have never used Swerve. I’d definitely recommend coconut sugar instead. I’ve actually used it in this recipe, and it works great! Cinnamon Rolls are the only thing I’m missing from gluten and I’ve been fantasising on. I read so many recipes and chose this one and good that I did. OMG!! This is better than any gluten one. I milled the flours myself and cut down the sugar (used coconut sugar) in almost half, added cardamon to the filling and drizzled a bit of maple on top instead of the icing. The result is DEVINE! No less. My family is in heaven, I made them so happy. Thank you. I think you cracked the flour combination right, well done! It’s a keeper for me. Yes, I do think that’s what the problem was. Whole psyllium husk doesn’t absorb as much liquid as the powdered variation. BUT, you can easily grind your whole husks to powder in a blender. So sorry you had an issue with that! These look amazing! i have tried to make them (with chia eggs) and after mixing all ingredients together the dough is not very sticky – it sticks together but seems very dry? What was the texture/dough like after baking it?